Asher & Adams' North Carolina and South Carolina circa 1872. Shows counties, county seats, railroads, railroad stops and natural features. The 1890s Heritage Village in the Gaston County Park in Dallas, N.C. Gaston County Historic Preservation Commission. Gastonia: A Map of Gastonia Dating Back to 1895 Made from memory by Giles Smith, born in Gastonia December 13th 1890. Dates are from records. Gastonia N.C. was incorporated 1877. Map completed May 12, 1972." Railroad map of North Carolina, 1900, examined and authorized by the North Carolina corporation commission. Gaston County Soil Survey, 1909 United States. Bureau of Soils. North Carolina. Dept. of Agriculture.US Government Printing Office. Map of Gaston County, N.C. showing rural delivery service. Washington, D.C. : Post Office Dept., 1912. Map of Mill Village. (Sept. 5, 1923) begun in 1920s and expanded and re-branded with Firestone logo after their purchase. Titled: "Dwelling Houses of the Firestone Cotton Mills, Inc., Gastonia, N.C." Factory Insurance Association, Hartford, Conn.
Map of Northern Portion, Loray Mill Village indicating location of strike headquarters. Loray Mill Strike, 1929. Transcription: "Union Headquarters (Where Aderholt Was Shot)" Pub. date unknown. Schematic Drawing, Loray Mill February 6, 1929, Manville Jenckes Corporation. North Carolina County Road Survey of Gaston County 1930, North Carolina State Highway Commission. Industrial and farm map of Gaston County, North Carolina, by Hugh E. White. 1931. Map shows townships, churches, schools, mills, dairies, landowners, foundries, textile mills, and hospitals. McAden Mill Number 2, Main Street, McAdenville, Gaston County, NC . Gaston County McAdenville North Carolina, 1933.﻿ Historic American Buildings Survey. Gaston County, North Carolina (State Highway and Public Works Commission) 1938. Gaston County, [North Carolina], supplement, ninth division 1949, North Carolina State Highway and Public Works Commission. Map of Libraries in Gaston County. ca. 1950s. Gaston County highmap with hand-drawn annotations showing the locations of branch libraries, book stations, book stops, and school. Gaston County (State Highway and Public Works Commission) 2 Sheets. January 1, 1953. Gaston County Map of Mill Village. Firestone Mill. January 1, 1963. County of Gaston, Office of Tax Supervisor, Gastonia, N.C.
Gaston County, North Carolina (Highway culture map). 1968. North Carolina State Highway Commission. Planning and Research Dept. Catawba River Basin-2 (Lower Basin) 1968, North Carolina. Dept. of Water and Air Resources. Gaston County, [North Carolina] (Geodetic Survey) 1968, North Carolina. Division of Geodetic Survey. Gaston County, North Carolina (Highway culture map) 2 Sheets. 1968, N.C. State Highway Commission. Planning and Research Dept. Gaston County, North Carolina (Highway federal-aid systems) 2 Sheets. 1968, N.C. State Highway Commission. Planning and Research Dept. Gaston County, North Carolina (Highway maintenance map) 2 Sheets. 1968, N.C. State Highway Commission. Planning and Research Dept. 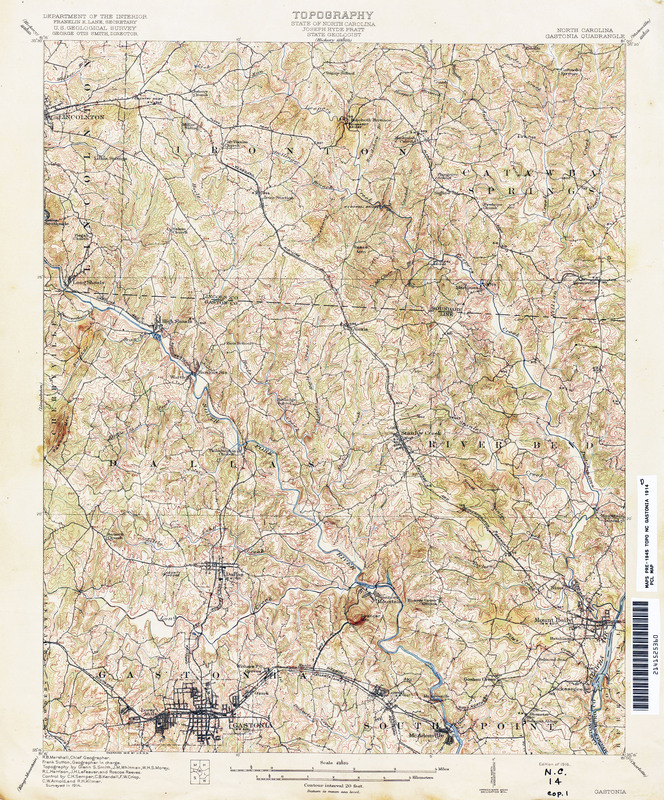 [Highway maintenance map of] Gaston County, North Carolina 2 Sheets. 1972, N.C. State Highway Commission. Planning and Research Dept. [Highway maintenance map of] Gaston County, North Carolina 2 Sheets 1980 North Carolina. Dept. of Transportation. North Carolina's river basins. "Map by Lee Ratcliffe from the Nov. 1999 special issue of Wildlife in North Carolina magazine, 'Rivers of North Carolina.' Published by the N.C. Wildlife Resources Commission. Base map copyright John Fels, 1997. "; Includes "Areas of North Carolina's river basins in square miles" and informational material. Loray Mill National Register Historic District map, by the City of Gastonia Planning Department, 2014.